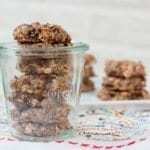 These chia oatmeal breakfast cookies are flourless so the texture is chewy and similar to baked oatmeal. They’re healthy, portable and delicious! I’ve been seeing a bunch of 2 ingredient cookies around the web recently and finally decided to try my hand at making a version of my own. I worked really hard to keep the ingredient list short and sweet but I had to add a few things — just like seven or so, no big deal. And oh well, because they’re good! 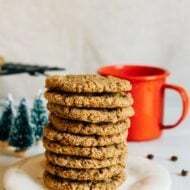 Anyhow, these cookies are made without any added sugar (except the sugar in the dark chocolate chips), no dairy or eggs and they can easily be made gluten-free if you make sure to purchase gluten-free oats. They’re also packed with hearty and healthy ingredients that will keep you feeling full all morning. 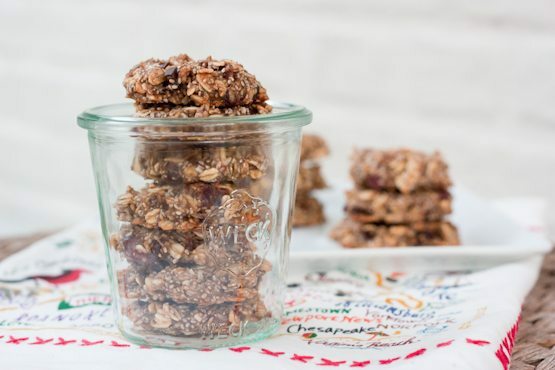 Chia seeds, oats, almond butter, coconut, dates… basically every ingredient in these cookies is healthy. They’re flourless so the texture is bit more chewy and similar to baked oatmeal. Hence, the reason I’m calling them breakfast cookies. 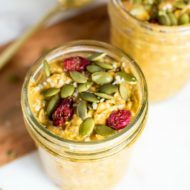 I’ve been eating them for breakfast and as a snack — they’re perfect for either situation and would be great to make for a brunch as well. If you’re making them strictly for breakfast and would like to cut out the chocolate, that’s cool. But I will admit, it’s pretty fun having chocolate for breakfast. Try it! Yum! I absolutely love the combination of ingredients in this recipe! I will be sure to try this sometime in the near future! 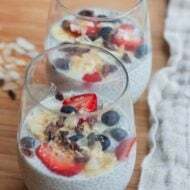 What a great idea to add chia seeds. I’ve been getting a bit bored of my own 2-ingredient (plus more) cookies so these are definitely being made this weekend! Thanks for the recipe. I got a bag of Chia seeds and have been looking for ways to use them! Those look like they need to be a part of my kitchen this weekend! thanks for sharing! These look SO good Brittany! Now I want these for breakfast! Can you leave out the dates? Those cookies look so good! I love Almond Breeze, it’s what I’ve been using as milk for years. Be careful with Almond Breeze, there’s an ingredient in it that is an inflammatory, Carrageenan. I used to drink it and switched to Silk Brand, Silk tastes wonderful and doesn’t have it! Wow, these look AMAZING! I love seeing how you use substitutions to make recipes healthier – totally an area I’m clueless about! These look amazing! I like your twist on them for sure. They are close to the cookie I gave you when you were in L.A. 🙂 xo! I made these yesterday, and I am making more this weekend! ( I may have to double the batch!) I added some millet, raw pumpkin and sunflower seeds, and some sprouted lentils! I LOVE them! I had three this morning before I went to the gym, and they held me through class. Thanks for the inspiration. As we speak these cookies are baking in my oven. I used rice milk instead of almond because I have an almond allergy and instead of coconut I used dried orange cranberries. Allergic to cocounut! lol I hope these turn out as good as yours. Thanks for all the great recipes! Perfect pregame or practice breakfast! I added 1tbsp local honey. Delicious!! 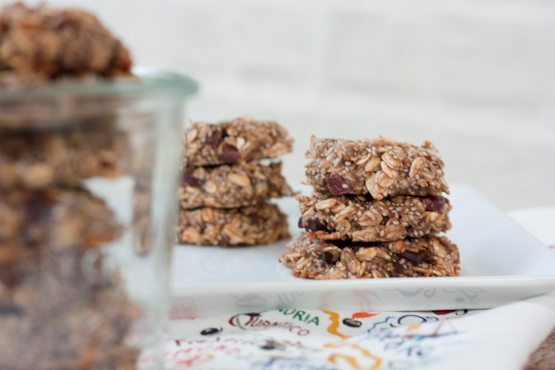 My 3-year-old and I made these with 2 Tbsp of Yummy Tummy (http://www.BabyBrainOrganics.com) instead of chia seeds for even more protein and omega 3s in this terrific treat! Could you add in Whey protein powder for extra fuel or would that mess with consistency? I just made these this morning after seeing them on Buzzfeed. They are delicious! My brother made me make him his own batch after trying one of mine!! Would you recommend using coconut milk? I can’t use almond milk and wondering what else would be a good option? Sure. I think coconut milk, rice milk, soy milk or any other non-diary milk would work! Would a normal dairy milk work fine as well? I just made a dozen of these with dried cranberries instead of dates, coconut-almond milk, and extra nut butter (peanut). Ahmahzing. Just made a batch today and they are wonderful! Even my picky two year old scarfed them up. I added about a tablespoon each of ground flax seed and wheat germ, and used peanut butter instead of almond. Next time I might throw in a handful of chopped nuts. Oh and I used semisweet chocolate chips instead. Delicious! Do you have the nutritional info for these? They look great! These are AH-MAZ-ING. 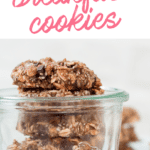 I’ve tried a million (okay, just three) oatmeal and banana based flour-less cookies type recipes and this is the best by far. 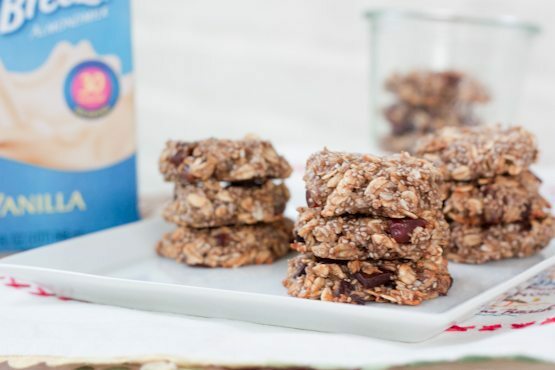 They are actually like cookies and not globs of banana-y oatmeal. Thank you, thank you, thank you! Aww. Thanks Kristin. Hope you are doing well! Brittany, these cookies are absolutely wonderful. I love them. Any idea on the nutritional info if I follow your recipe to the letter? Hi, is it old fashioned oatmeal or just rolled oats? Could you use normal milk? Is the temperature of the oven in Celsius? I can’t wait to try these! I’d also know where to find one of the Virginia napkins in the photos! So super cute. Is there a way that I could sub in pumpkin puree for one of the bananas? About how much would you recommend? You could try it! I’d start with 1/4 cup. I just made some tonight. My husband and my girl friend and me really like it a lot. So healthy and so easy to make it. Thank you so much for sharing. 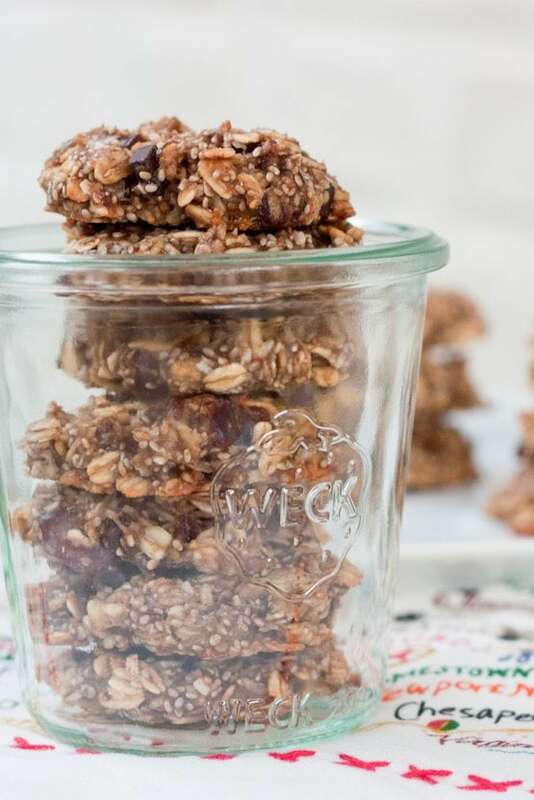 Hi, I really love this recipe, but since I’m going raw, I was wondering if you’d recommend (as far as you know) to dehydrate these cookies. With those ingredients, should be easy too (maybe less almond milk so it won’t be so wet). Hmmm… good question! I think you can definitely try dehydrating them and I think less almond milk would be ideal! Let me know how they turn out if you try it. Since I dislike almond milk, could vanilla soy milk work??? O.M.G.! These are amazing! Only changed one ingredient: traded low-sugar craisins for the coconut. Otherwise, followed recipe exactly. DH, who has been chafing at the lack of “treats” in our healthy eating plan over the last 2 years, is so-o-o happy. These are every bit as delish as bad-for-you cookies. Plan to try the carrot cookies next. Thank you! So easy and delicious! Love that they are flourless! These are nice and so easy even I can make them ehe.